cfSolutions Sdn Bhd | ZICO HOLDINGS INC.
Home Fund Raising Services Track Record ZICO HOLDINGS INC.
(Registered by the Singapore Exchange Securities Trading Limited (the “SGX-Sr) acting as agent on behalf of the Monetary Authority of Singapore (the “Authority”) on 30 October 2014). 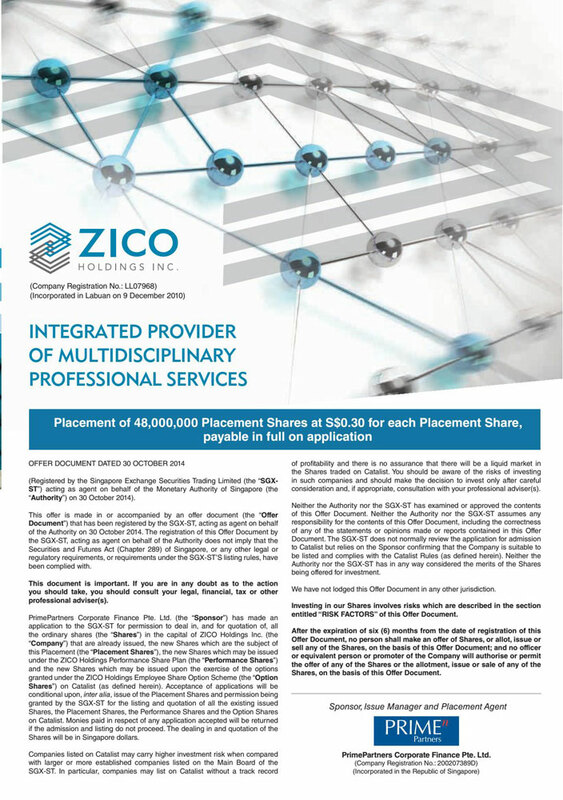 ZICO Holdings Inc. (“ZICO” and together with its subsidiaries and associated companies, the “Group”) is an integrated provider of multidisciplinary professional services which was listed on Catalist of the Singapore Exchange Securities Trading Limited (“SGX-ST”) on 11 November 2014. The Group is focused on the ASEAN region and through its multidisciplinary services, regional capabilities and local insights, ZICO enables its clients to capitalise on opportunities across Southeast Asia. The Group’s clients include governments and government-linked companies, law firms, private and public listed companies, multinational corporations and high net worth individuals. ZICO has business operations in Indonesia, Lao PDR, Malaysia (including Labuan), Myanmar and Singapore. The Group augments its existing regional presence with that of the ZICO law network to extend its reach to 8 out of 10 countries in Southeast Asia. These 8 countries include those where ZICO has business operations in as well as Cambodia, Thailand and Vietnam where ZICO does not presently have business operations. cfSolutions was the Malaysian Financial Adviser for Zico.